Wash and cut the kovakkai lengthwise into 4 to 5 pieces . Add turmeric powder and salt and mix well. Keep it aside. 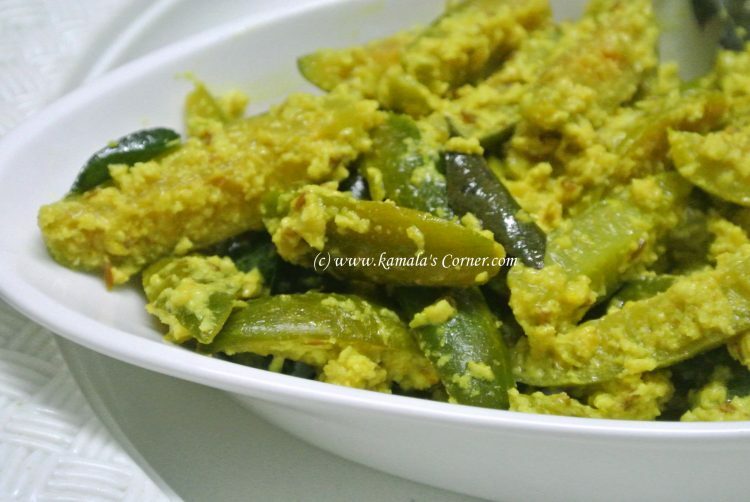 Grind coconut, Jeeragam (Cumin) and green chillies together to a coarse paste using one or two tablespoons of curd. In a Kadai put a tablespoon of oil. When it is hot add the marinated Kovakkai pieces and stir fry for 2 to 3 minutes or till it is half cooked. Sprinkle a handful of water and mix well. Close with a lid and cook on low flame till it is 3/4th cooked. (Ensure not to overcook). Now put the coconut paste on top of the vegetable and close with the lid. Do not stir now. After one or two minutes, open the lid and stir well. Add curry leaves and remaining oil. Mix well and cook for few more seconds. Finally, beat the curd well and add it to the vegetable and give a quick stir and remove.